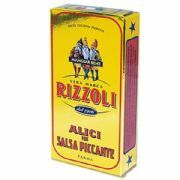 Salted Anchovy Fillets, Ortiz - packed with flavour but do remember to rinse off the salt and prepare before using (see below). 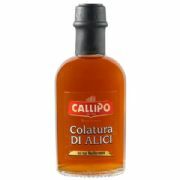 Perfect for pizzas, salads, pasta such as spaghetti puttanesca and many other dishes. 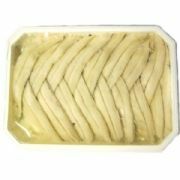 Store in a cool place below 15C and once the pack has been opened, clean all of the anchovies (see below for details), cover with olive oil and refrigerate below 5C. Soak the anchovies in cold water for 10 minutes and clean them under running water rubbing the salt off with your fingers. Open the anchovy from the top half of the fish while it is still under the tap. With the help of your thumb, separate the two anchovy fillets. Remove the bone and finish cleaning. 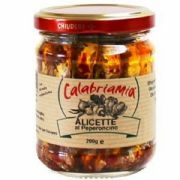 Dry the anchovies lightly with a cloth, lay them in a container and cover them with your favourite olive oil. 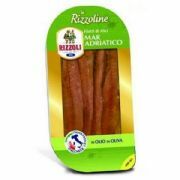 Ortiz anchovies are only fished from Mediterranean waters, under strictly controlled regulations. They are fished using a purse seine net, which prevents damage from an overly weighty haul and also allows regeneration of the fish stocks. 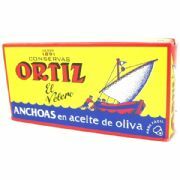 Ortiz select only top grade anchovies, defined by size, which are prepared to the highest standards, spending at least 6 months curing in rock salt. They are large and meaty and are trimmed and filleted by hand with knives not scissors, which although time consuming, avoids any hairiness. N.B. 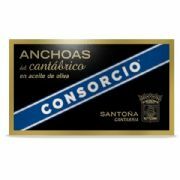 As these anchovies must be kept chilled below 15C they are only suitable for mainland UK delivery, excludes off shore islands, Northern Ireland & Scottish Highlands.